The magical moments—those moments of pure joy, wonder, and discovery. The feeling you have as you sit bundled under a blanket next to your best friends, heads tilted back and gazing in awe at the Northern Lights dancing in the crystal-clear sky. The catch in your breath as you drive from Calgary and see for the first time the majestic mountains that seem to burst straight from the ground. Watching the powdery snowflakes float gently to the ground and anticipating how fun tomorrow will be. The sensation of making smooth, floating turns through light, soft snow. Mushing a team of sled dogs across the fluffy expanse. Gliding past the evergreens on a toboggan. Ice skating on a pristine frozen lake. Soaking in a rejuvenating outdoor hot spring. These are the moments you’ll remember forever. And if you’ve built up your appetite from a full day having fun in the outdoors, rest assured you’ve got a variety of dining options to explore. A UNESCO World Heritage Site, Banff and Lake Louise is known for exceptional natural beauty, rare wildlife, and abundant land-forms. Winter here is an outdoor paradise with endless adventures surrounded by some of the most spectacular scenery you can imagine. As you plan your visit, have a look at some of the experiences you’ll want to add to your list. Three Ski Resorts. One Lift Ticket! Trade the crowded, condo-lined slopes of many large ski areas for the pristine, untouched mountain wilderness of Banff and Lake Louise. Not only will you discover one new ski area on this trip, you’ll discover three of Canada’s best: Mt Norquay, The Lake Louise Ski Resort and Banff Sunshine. The three resorts in this UNESCO World Heritage Site boast 8,000 acres of skiing, two gondolas, 26 chairlifts, breathtaking natural beauty and 30 feet of dry Canadian Rockies powder every year! The best part? One tri-area lift ticket will get you into all three resorts so you can enjoy them all during your stay. Aside from mastering the slopes, there are a zillion other outdoor activities for the whole family to experience as you take in the fresh mountain air and stunning scenery. Bring out your kids … and the kid in you! Exchange your skis and boards for a toboggan or inflatable tube and glide down the slopes for a thrillingly fun winter activity. 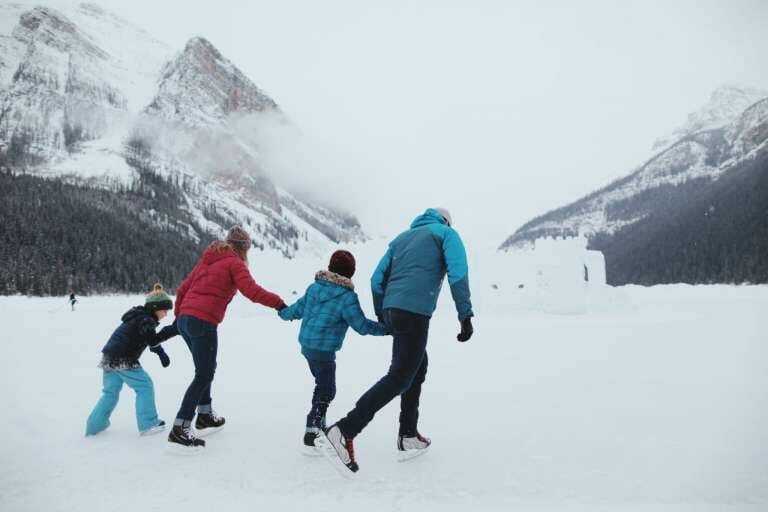 The gradual hills, consistent snowfall, and mountainous backdrops of Banff and Lake Louise make for an idyllic tobogganing destination for everyone to enjoy. Lacing up your ice skates on a frozen lake is about the most iconic Canadian thing ever you’ll ever do! Ice skating invites all your friends and family to have fun in the crisp mountain air. Immerse yourself in the natural beauty of your surroundings or maybe join in a game of pick-up, or “shinny” hockey. There are several indoor and outdoor ice skating rinks open during the winter. All skating rinks are free unless otherwise noted, and skate rentals are available in both Banff and Lake Louise. The Canadian Rockies boasts some of the best and most varied ice climbs in the world—and Johnston Canyon is a special place. Join a guided interpretive tour and explore both the lower and upper frozen waterfalls via suspended catwalks. Ever thought you’d scale a frozen waterfall? Whether you’re a beginner or an experienced ice climber, there are expert accredited guides that will help scale you up to the top. How often are you pulled on a sled by a team of dogs through the most awe-inspiring landscape you’ve ever seen? Traveling by dog power is a truly remarkable experience—tranquil at some times, and exhilarating and delightfully chaotic at others. Race across the frozen landscape and have a ride of a lifetime. Try your hand at mushing your very own team of Alaskan huskies or cocoon yourself in blankets and relax as your experienced musher guides your team through the mountains. Snowshoeing is a great choice for a fun winter activity because it’s easy to learn, inexpensive, and can be enjoyed by people of all ages, fitness levels, and experience. You can rent gear and head out on your own or join guided excursions from several local tour operators. Some special highlights include the Marsh Loop, a great choice for families, offering expansive views of the Bow Valley and lots of potential for wildlife viewing; and the Ink Pots via Moose Meadows trail, which takes you through dense forest to brilliantly colored mineral springs in an open meadow. Relax those tired muscles and unwind with a relaxing soak in the mineral-rich waters at one of Banff’s hot pools or spas. It’s magical to sit in the pools in the wintertime, watching snow fall on the surrounding peaks. Sunrise and sunset are especially wonderful times to soothe yourself and admire the views. The Banff Upper Hot Springs are open until late in the evening year-round and include a large pool and café. Swimsuits, towels, and lockers are available to rent. If you enjoy food, you’re going to be well satisfied here—the local restaurateurs, microbrewers, spirit distillers, lounge and club owners are as varied as the scenery. Banff and Lake Louise have developed great culinary reputations, with talented chefs creating delicious food of all types. Local chefs offer up some of the best regional dining—known as Canadian Rocky Mountain Cuisine—which features seasonal produce and beef and bison from nearby farms. There are also plenty of other dining options too: Western-style steakhouses, Swiss fondue, Italian, Pub food, Japanese, Thai, vegan … the options are endless. Many international and North American airlines fly directly to the Calgary International Airport (YYC), located just 78 miles from Banff National Park. From there, Banff is an easy 90-minute drive along the all-weather, four-lane Trans-Canada Highway (Hwy #1). Lake Louise is a scenic 40-minute drive further west. Rent a car or take one of the scheduled bus services from Calgary International Airport and downtown Calgary to Banff and Lake Louise. Once you’re here, public buses, taxis and complimentary shuttles are at your service. Ready to go? 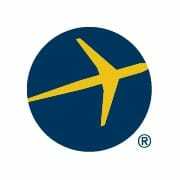 Start planning your trip on Expedia. What experiences in Banff and Lake Louise are on your must-do list?